To Cite: Khazaei Koohpar Z, Entezari M, Movafagh A, Hashemi M. Anticancer Activity of Curcumin on Human Breast Adenocarcinoma: Role of Mcl-1 Gene, Int J Cancer Manag. 2015 ; 8(3):e2331. doi: 10.17795/ijcp2331. Background: Breast cancer is the second leading cause of cancer-related death among females in the world. To date, chemotherapy has been the most frequently used treatment for breast cancer and other cancers. However, some natural products have been used, as alternative treatments for cancers including breast cancer, due to their wide range of biological activities and low toxicity in animal models. Objectives: The present study examined the anti-proliferative activity of curcumin and its effect(s) on the apoptosis of breast cancer cells. Materials and Methods: This study was performed by an in vitro assay and the anticancer effects of curcumin were determined by MTT (3-[4,5-dimethylthiazol-2-yl]-2,5 diphenyl tetrazolium bromide). We used quantitative real time Polymerase Chain Reaction (PCR) for detection of Mcl-1 gene expression in treated groups and then compared them to control samples. Results: In the treatment group, there were higher levels of cell death changes than the control group. The results also showed that the Mcl-1 gene expression declined in the tested group as compared to the control group. Conclusions: Our present findings indicated that curcumin significantly inhibited the growth of human breast cancer cell MCF-7 by inducing apoptosis in a dose- and time- dependent manner, accompanied by a decrease in MCF-7 cell viability. Furthermore, our results showed that quantitative real-time PCR could be used as a direct method for detection Mcl-1 gene expression in tested samples and normal samples. It is known that breast cancer is the most common cancer for women worldwide, and accounts for approximately 25% of all female malignancies with a higher prevalence in developed countries. Breast cancer is the second leading cause of cancer-related death among females in the world (1). The discovery of novel natural compounds with low toxicity and high selectivity for killing cancer cells is an important area in cancer research (2). To date, chemotherapy has been the most frequently used treatment for breast cancer and other cancers. However, this method of treatment also destroys some normal cells as well. Due to their wide range of biological activities and low toxicity in animal models, some natural products have been used as alternative treatments for cancers including breast cancer (2). Curcumin or diferuloylmethane is the major yellow pigment extracted from turmeric (Curcuma longa) and is commonly used as a flavoring agent in food (3). Curcumin has been widely studied for its anti-inflammatory, anti-angiogenic, antioxidant, wound healing, and anti-cancer effects because of its medicinal properties in Indian and Chinese medicine (2). Moreover, extensive research has shown that curcumin possesses anti-proliferative and anti-carcinogenic properties in a wide variety of cell lines and animals (4). In addition, recent studies have shown that curcumin, either alone or in combination with other anticancer agents, can efficiently induce apoptosis (2). Apoptosis is a tightly regulated process of programmed cell death, including the activation of various molecules for initiating cell death. Specific activation of apoptosis in tumor cells offers a promising approach for cancer therapy. However, the specific mechanisms of curcumin-induced cytotoxicity remain controversial due to the variable anti-and pro-apoptotic signaling pathways in different cell types. Oxidative stress derived from curcumin through production of reactive oxygen species and oxidative damage causes DNA modification. This process continues and carries on proteolytic events and induces apoptosis (4). Plenty of proteins and a number of genes regulate apoptosis, in which two pairs of proteins play an important part. Bcl-2 is a member of a family of proteins involved both in preventing apoptosis (pro-survival) and in promoting it (pro-apoptotic). Anti-apoptotic proteins include the Bcl-2 family (such as Bcl-2, Bcl-XL, Mcl-1 etc.). Pro-apoptotic proteins are sub-grouped into the Bax family (such as Bax, Bak, etc.) and the BH3-only family (such as Bid, Bad, Bim, etc.) (5). The Tumor Necrosis Factor (TNF)-Related Apoptosis Inducing Ligand (TRAIL) has promising anticancer activity. Curcumin enhances TRAIL-induced apoptosis of breast cancer cells by regulating apoptosis-related proteins (such as Mcl-1, ERK and Akt) (6, 7). The exact mechanism by which curcumin exerts its apoptotic effects in breast cancer cells still remains unclear. The present study examined the anti-proliferative activity of curcumin on breast cancer cells. Curcumin was purchased from Sigma-Aldrich Corporation and was prepared with Dimethyl Sulfoxide (DMSO) at a concentration of 10 mM, stored as small aliquots at -20°C, and thawed and diluted as needed in cell culture medium. Dimethyl Sulfoxide, Propidium Iodide (PI) and trypsin were purchased from sigma (St, Louis, Mo, USA). Roswell Park Memorial Institute (RPMI) 1640, penicillin, streptomycin and other cell culture supplies were from Gibco BRL (Grand Island, NT, USA). Fetal bovine serum was from Hyclone (Logan, UT, USA). MTT (3-(4,5-dimethylthiazol-2-yl)- 2,5- diphenyl trazolium bromide) was obtained from Fluka (Ron Konkoma, NY, USA). 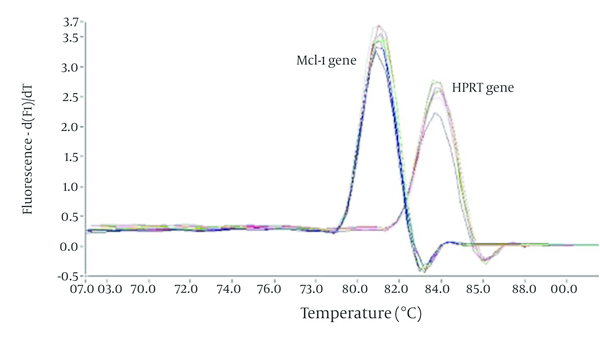 Human breast cancer cell line, MCF7, was obtained from the Pasteur institute of Iran. These cells were cultivated in T75 tissue culture flasks in RPMI-1640 supplemented with 10% fetal calf serum, 100 μg/mL penicillin, 100 μg/mL streptomycin, 2 mM L-glutamine, and 20 mM hydroxyethyl piperazine ethanesulfonic acid, and incubated in a humidified incubator containing 5% CO2 at 37°C. To diminish test error level, the MTT strain was added to wells without cells and along with other wells, absorbance level was read and ultimately subtracted from the entire absorbance. Total RNA was extracted from cells using an RNA isolation reagent (sigma) as recommended by the manufacturer and the extracted RNA was purified using RNeasy Mini Kit (Qiagen), and cDNA was synthesized using Quantitect Reverse Transcription Kit (Qiagen) according to the manufacturer’s instructions. Reverse transcription was carried out as follows: 42°C for two minutes, 42°C for 15 minutes, and 95°C for three minutes (one cycle). cDNA was stored at -20°C for PCR. Real-time PCR was performed in a 25 µL reaction solution. The following sequences were used as primers (Table 1). Real time PCR was carried out in optical grade 96-well plates (Micro amp, Applied Biosystems, Singapore) at reaction volume of 25 µL, including 12.5 SYBR Green Master Mix (Primer design), 300 nm of each primer and 5 ng of template DNA. All samples were run in duplicates. Thermal cycling was performed on the Applied Biosystems 7300 real-time PCR system. Threshold cycle (Ct) data were collected using ABI Prism 7300 sequence detection system version 1.2.3 (Applied Biosystems, UK). Statistical significances were calculated using the Student’s t-test and one-way analysis of variance. The eﬀect of curcumin was studied as a dose-response experiment. Proliferation of MCF7 cells was significantly inhibited by curcumin in a concentration-dependent manner during 48 hours (P < 0.01). 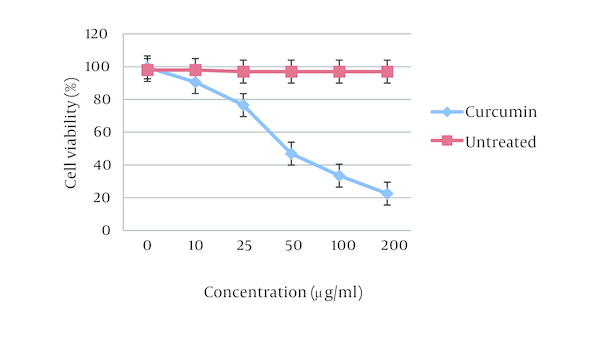 Different concentrations of curcumin at 48 hours had different cytotoxicity effects on MCF7 cell line (Figure 1). The 50% inhibition concentration (IC50) values of curcumin on MCF7 cells was determined (Figure 2). Furthermore, IC50 was determined by probit analysis using the Pharm PCS (Pharmacologic Calculation System) statistical package (Springer-Verlag, USA). There were significant differences in IC50 curcumin (P < 0.05). As expected, there was a significant difference between the tested and normal samples regarding Mcl-1 gene expression changes. To optimize and validate the real-time PCR assay before using the ΔΔCT method for gene expression, a validation experiment was performed to determine the PCR efficiencies of the target and the reference genes. Melting curve analysis was performed for every single reaction to exclude amplification of non-specific products. Each valid amplification reaction displayed a single peak at the expected Tm (melting temperature). The results also showed that Mcl-1 gene expression declined in the control group as compared to the experimental group. The mean ratio was determined for both groups as follows: 1.04 ± 0.13 for control group, and 0.49 ± 0.12 for the experimental group. For centuries, curcumin has been consumed in the diet and used as a herbal medicine in several Far Eastern Countries (2). Curcumin has cancer chemopreventive properties in a variety of animal models of chemical carcinogenesis, including those resulting in tumors of the mammary gland (6, 7). Oxidative stress and oxidative damage are involved in the pathophysiology of many chronic inflammatory and degenerative disorders, particularly cancer. The generation of Reactive Oxygen Species (ROS), particularly O2− and OH, play important roles in the development of cancer (8, 9). Curcumin has been shown to scavenge O2− and OH radicals (10, 11). As evident curcumin expresses anti-oxidant, anti-inflammatory, anti-antigenic, anti-mitotic and anti-metastatic activities in vitro and in animal experiments, thus it might be a promising molecule for the prevention and treatment of cancer in humans. Curcumin has antiproliferative effects in different types of cell lines in vitro. One of the initial reported descriptions of curcumin cytotoxicity occurred in Dalton’s lymphoma ascites cells, in which curcumin at a concentration of 4 μg/mL produced 50% cytotoxicity. Curcumin also inhibited the growth of Chinese hamster ovary cells and human leukemic lymphocytes in culture (12). At a concentration of 20 μg/mL, curcumin produced 50% growth arrest in K-562 human chronic myelogenous leukemia cells (13). Curcumin has also been shown to inhibit the growth of human breast cancer cell lines in vitro (5), including HL60, k562, MCF- 7 and Hela cells (14). Also, to date, no curcumin-related toxicity was observed in either experimental animals or humans, even at very high doses (15). Our data are consistent with previous studies that reported curcumin exerts its anticancer effects via proliferation inhibition and apoptosis induction in breast cancer cells (15). In this study, the effect of different curcumin doses (0 - 100 µm) on MCF-7 cell morphology was examined. After a 24-hour period, curcumin treatment caused MCF-7 cell shrinkage, rounding and partial detachment, thus demonstrating the cytotoxic effects of curcumin on MCF-7 cells. On assaying the effect of curcumin on cell viability by the MTT assay, we observed a decrease in cell viability. 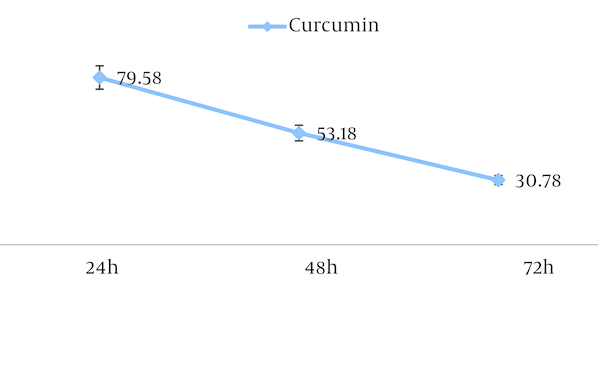 At curcumin concentration of 40 µm, significant loss of viability can be detected during the 0-24 hour treatment period. It is important to mention that curcumin-mediated reduction of cell viability was dose- and time- dependent. Our present findings indicate that curcumin significantly inhibited the growth of human breast cancer cell MCF-7 by inducing apoptosis in a dose- and time- dependent manner, accompanied by a decrease in MCF-7 cell viability. Curcumin is highly cytotoxic toward several colon cancer cell lines. Curcumin blocked the entry to cell cycle from G2 to M by inhibiting expression of cdc2/cyclin B (16). The proapoptotic members of the Bcl-2 family, such as Bax, were activated, and antiapoptotic genes such as Bcl-XL were inhibited by curcumin (17). Curcumin also triggers caspase-3-mediated cell death. It activated GADD153, which in turn acts as an activator of apoptosis (18). Curcumin decreases the expression of antiapoptotic members of the Bcl-2 family and elevates the expression of p53, Bax, and procaspases-3, -8 and -9 (19). We selected the Mcl-1 gene, because the bcl-2 family of proteins functions as pro- and anti-apoptotic members (20). The bcl-2 members such as bax, bak, bad or bcl-Xs promote apoptosis, whereas other members such as bcl-2 and bcl-Xl prevent apoptosis by blocking the translocation of cytochrome c, and subsequent caspase activation. Mitochondria are involved in excitotoxic injury during cerebral ischemia and the release of cytochrome C, an apoptogenic factor that propagates death signals by triggering caspases leading to cell death. Using these assay, status of all subjects was successfully determined (5). We expanded the coverage of the detectable Mcl-1 gene by SYBR Green assay for Mcl-1 gene expression. Given the potential and safety of curcumin, it is a promising candidate for therapy of breast cancer, although additional studies are needed. We sincerely thank the department of herbal medicine, Institute for Islamic and Complementary Medicine of Iran for their financial supports. Authors' Contributions: Zeinab Khazaei Koohpar, Maliheh Entezari and Abolfazl Movafagh: performed the laboratory experiments and prepared the manuscript. Mehrdad Hashemi: designed the study, provided technical support, performed the laboratory experiments, analyzed the data and revised the paper extensively. Funding/Support: The Department of herbal medicine, Institute for Islamic and Complementary Medicine of Iran provided funding for this research.